An artist’s impression of light rail on Adelaide Avenue. Photo: Supplied. 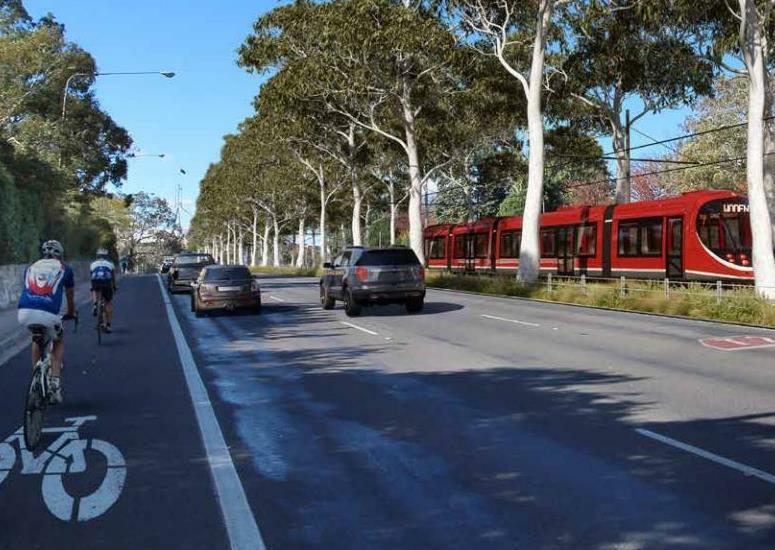 Concern appears to be mounting about the impact the preferred light rail Stage 2 route will have on southside commuters and the efficiency of the network as it grows, with a petition launched and some submissions to the current Parliamentary inquiry highlighting the issue. Although still referred to as being part of the north-south spine, the Stage 2 route chosen by the ACT Government deviates through the Parliamentary zone’s employment and tourism centres on the way to Woden and will mean journey times of 25-30 minutes compared with current Blue Rapid bus times of 13-16 minutes. This will also affect northside commuters making their way to Woden. Respondents to a survey last year during the public consultation favoured Stage 2 taking in Parkes and Barton, but travel times were not available at the time and the Government has been unclear about how light rail will affect rapid bus services between the City and Woden, apart from emphasising that there will be an integrated network. The new bus network out for consultation already reduces rapid services between Woden and the City, with frequency cut from a peak-hour bus every two minutes to one every six minutes, which the Woden Valley Community Council (WVCC) says will mean commuters spending more time in interchanges. “It is likely the tram (25-30 minutes) will take up to 15 minutes longer than the Blue Rapid (13 minutes off-peak, 16 minutes peak), an additional 30 minutes for the return trip from Woden to Civic, equals two and a half hours per week, equals up to 130 hours per year,” the WVCC says. Ensure public transport travel times are maintained for residents living in Canberra’s south should a light rail from Woden to the City be built. 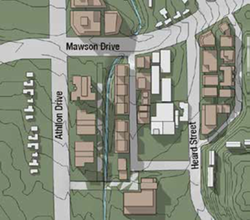 Commit to a direct alignment (using the west side of State Circle to link Adelaide Avenue to Commonwealth Avenue) and extension of the track to Mawson. Provide for express services by reserving room in the corridor for a future third track. 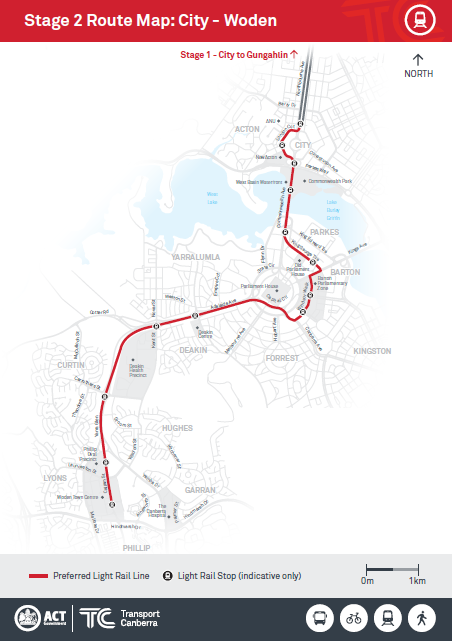 “The light rail Stage 2 alignment from Gungahlin to Woden (via Barton) does not provide a direct, fast service for residents from the south of Canberra,” the petition says. Its submission says consideration of the section through the Parliamentary Triangle should not be taken in isolation of the broader network and approvals should not be given without a thorough cost-benefit analysis. “This also includes investigation of the benefits and costs of longer travel times for the backbone of Canberra’s public transport network by deviating through the Parliamentary Triangle. It also includes analysis of the origin/destination data and the patronage data for over 130,000 people in Tuggeranong, Woden and Weston,” it says. The Griffith-Narrabundah Community Association also has concerns about journey times, as well as the impact of light rail construction on the Parliamentary Zone. In its submission to the Parliamentary inquiry, the Association says the Government’s proposal for light rail to enter the heart of the Parliamentary zone should be rejected until the ACT Government provides a full business case that includes a rigorous social cost-benefit analysis. It notes that Government has announced that a number of direct bus services from the northern suburbs into Civic will be discontinued, forcing passengers to change on to the tram at Dickson. 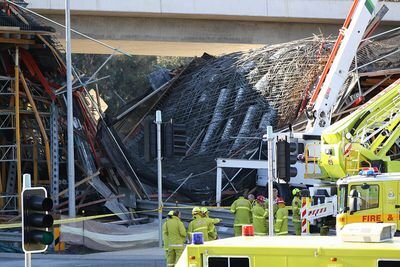 “The Committee should take into account any plans for a reduction in direct bus services from Woden Valley, Weston Creek and Tuggeranong to both Civic and the Parliamentary zone which would have a similarly adverse effect on workers travelling into the zone from the South,” the submission says. Out Weston Creek way, the Community Council is asking what’s the benefit of light rail if the service is worse than the current bus network. “Council would be concerned if the proposed light rail could not provide the same timetable and service for commuters. If the light rail cannot provide a similar service then what benefit can the light rail provide?” its submission says. It is also concerned about the indirect nature of the Stage 2 preferred route through the Parliamentary zone and echoes calls for a cost-benefit analysis. The Planning Institute of Australia (PIA), while supportive of light rail and acknowledging that servicing Barton has merit, says in its submission that it is not clear that the opportunities of the Barton deviation should be part of the Stage 2 North-South corridor project. “PIA is concerned that by adopting the Barton deviation as part of Stage 2, the opportunity for a faster north-south corridor service will be foregone. The resulting function and role of the light rail system would be different. This potential departure from a more rapid transit role of the network should be further justified against the overarching city planning and transport objectives that surround the project,” it says. It believes Barton could still be serviced without sacrificing the integrity of the north-south corridor. There will be a public forum on Stage 2 at Eastlake Football Club in Griffith next Tuesday 10 July, at 7:00 pm. The forum will discuss the implications of light rail for travel options, costs and benefits, urban development, heritage values, and open space. Blue rapid goes when the new timetable come in. It is replaced in the south by one route that follows the blue rapid to the city and another that follows roughly the same route as the stage 2 light rail. As for buses we getting 14 trams later in the year which will free buses up, plus there are 40 new buses to be delivered this year (5 or so have just entered service)l and 12 more have been delivered) which are replacing about 15-20 older buses (so a net gain of 20-25). 10 of the new buses are articulated and 30 standards. I can't believe one of the leading arguments people have is that it looks good, modern and futuristic. Forget practicality, it looks cool! That's all I got from reading the responses to this post! And yes FYI, I take the 300 Civic-Woden buses twice daily 5 times a week. These people who don’t mind doubling the travel time between Woden and Civic… do you actually commute on a daily basis? I take the 300 buses twice daily 5 times a week. I invite these pro-Barton route supporters to talk to 300 bus commuters in the Woden or Civic bus stations and ask what they thing. Cmon. Just stand there for half an hour during peak hour and talk to people. Real people that commute. I would be extremely surprised if anyone actually said doubling their Civic-Woden travel time is acceptable. I suspect all these so called expert decision makers don’t take buses at all. Hi Spades, rest assured, the travel time between Woden and Civic won’t be doubled, that’s just more anti-light rail hysteria. From the figures being presented by the government, it’s clear that travel times will double. Seems the only hysteria is from light rail supporters who refuse to acknowledge the flaws of their preferred transport mode. It’s seems like the support is almost religious at times. Basing these times on actual usage. If light rail is estimated to take 25 minutes, including the stops around Barton/Parkes, then those claiming it “doubles” the time are estimating the bus travel time at 12.5 minutes, which is incorrect. However the language of anti-light rail folk often tips over into the hyperbolic. Seeing as the current bus averages 13-16 minutes, that’s pretty much a clear doubling, particularly for the preferred Barton route. The hyperbole would seem to mainly be from people who can’t admit the clear failings of light rail and the route chosen. If we’re comparing like for like on the route then 25 minutes is the estimate for the same route. The bus I caught yesterday took 20 minutes. Double? No. The bus times aren’t going to get any quicker. The advantage of light rail is that it doesn’t get caught up in traffic going over the bridge. Whilst I acknowledge there is a debate to be had around whether the light rail stage 2 should go left around Parliament House or right around Parliament House (with a few more stops for Parliamentary triangle worker) there needs to be more reality around travel times. I’ve asked elsewhere but does anyone remember when the 333 from Belconnen to the City used to take 15 minutes and travelled via Eastern Valley way and Belconnen way. The a 5 minute diversion was put in to go up Hayden Drive and College Street. Almost overnight there was an increase in useage on this route. Now days a look at the timetable in peak hour shows this route taking 24 minutes, a full 9 minutes longer than before an interestingly about the same time proposed for Woden to City via Barton. So in essence if stage 2 goes via Barton AND fully replaced the direct service it is no different to the diversion put into the city to belco route all those years ago. End result more people more locations. And I say the assumption is the stage 2 will replace direct buses. If you look at the new bus network there are actually two rapid routes from the city to Woden. One is direct one follows the route of stage 2. Whilst the government hasn’t said it I would almost bet that until an express stage goes beyond Woden then there will still be an express bus direct to the city. And if an express stage goes beyond Woden I reckon a bit will be built to make Woden to city direct possible. So what you’re saying is that an effective bus network can deliver the same benefits as a light rail one for a fraction of the cost? And is also more flexible to be able to change routes as passenger numbers, destinations and preferences change? It is interesting that journey time is now important for Stage 2 when no one seemed to be worried about Stage 1 taking twice as long as the RedRapid. Chris you do realise that different people live in Gungahlin and the south right? Woden is a hub for many other districts in the south whereas Gungahlin is a dead end district. The Woden bus station services residents of the Woden Valley, Weston Creek and Tuggeranong districts. When you double the travel time between Civic and Woden, you'd still need to add people's travel time from Tuggers/WC to Woden on top of that. Carlo Soggs Most people in Gungahlin need to catch a bus to get to the tram. Then catch another bus after the tram trip. warren the cost of stage 1 is not and has never been $1.6b. In today’s dollars the cost to build, finance and run is just over half that figure. The figure when you factor in inflation is about $1.2b in future dollars spread over 20 years. That’s not the same as buying something today for $1.2b. Either way it’s still a waste of money. JC, according to the auditor general the full cost to the taxpayer of stage 1 over 20 years in nominal dollars will be something like $1.78b. Given that the long term inflation target for the RBA is between 2-3 %, indexing the present value of the project at 2.5% p.a. for 20 years is more like $1.4b rather than your figure. However, the cost of capital is not measured by inflation but rather by interest rates. As such, your attempt to downplay the cost of stage 1 is misleading. Regardless of cost measurement methodology, the government’s own study showed that BRT would have provided the vast majority of the benefits of LR for less than half the cost. As such the taxpayers of the ACT will be footing the difference, which effectively goes straight to the construction consortium and their primarily interstate and international suppliers. Less than 1% of ACT Budget. I am yet to see any of the car fans raise the issue of the cost of all the new roads and associated infrastructure. But I guess, as they like to drive, the costs are always going to be affordable. What about the “freebies” the tram gets by using the road infrastructure that is already there for cars? Less than 1% of the budget? This is a ridiculous statement when you consider the fact that the ACT cannot arbitrarily raise large amount of income through anything other than household rates and that the vast majority of our spending is fixed and recurrent on things like health and education. When you then factor in the fact that stage one will only service a tiny percentage of the population, the reality is shown that it’s a huge burden on our budget. The entire transport budget for the ACT is less than 5% of the budget. It’s a huge impost. As for your take on roads, there’s been many people here who have suggested large spending on new roads should also face proper scrutiny but at least road spending like the Majura parkway was shown to have a cost benefit ratio of 4, compared to light rail stage 1 at 1.3 with some very questionable assumptions. Yes, Chewy14, less than 1% of the Budget. As to your claim that Light rail stage one will only serve “a tiny percentage of the population” I doubt whether you could claim that Gungahlin plus the inner north is a tiny percentage. The anti-light rail claims about devastation to the health and education budgets don’t seem to be holding water. Cost benefit on roads also needs to take in the increased health impacts of over-reliance on the car which has been shown to have negative impacts on the health budget. That impacts on your cost-benefit assertions. Yes, 1% of the budget, a massive impost as I’ve shown considering the makeup of the budget and the potential benefits of the project. And yes, the area and population serviced by light rail stage one is tiny. Even if you assumed it served the entirety of North Canberra and Gungahlin, it would only be 25% of the total ACT population, but realistically it’s only servicing those who live near the line or around 10% of the population. As for cost benefit analyses, they already include health impacts, so no changes necessary my “assertions” are just letting you know the facts. Less than 1% of the Budget for an improved transport system doesn’t seem too much of an impost for most ACT voters. You don’t have to live right next to the light rail to use it. Plenty of Sydneysiders don’t live right next to the light rail however it is comprehensively used. You’ve also forgotten to take into account visitors to Canberra. Your ‘facts’ may need a little more research. But this isn’t the cost for an improved transport system, it’s the cost for stage 1 of a light rail network that might service 10% of the population. And that’s not even considering the fact that the government’s own research showed that they could deliver almost the same benefits for less than half the cost with a BRT system. 1% is clearly a huge impost. As for visitor numbers, what makes you think they are concentrated in Gungahlin/NorthCanberra or that they would be travelling to/from those areas in light rail when there almost zero major tourist attractions in that route? My facts are backed up by the research, the fans of light rail seems to base their arguments on emotion. Garfield the same Auditor General report confirms the total contract value over 20 years is $939m in present (2016) day cost. Weather it is $1.2b or $1.6b in future costs is a matter of different crystal ball gazing methods. On the bright(ish) side, a tram wending its way through the Parliamentary zone will add to the gee-whiz theme park vibe for inter-State visitors to our fair city. The Parliamentary zone detour also, of course, with all its concomitant costs and complications, underlines the point that after nearly 30 years of self-government, the ACT Government is still, to a considerable degree, just a glorified body corporate/strata manager for the federal Government. Here's an alternative idea. Instead of spending $1.6billion on one inflexible tram line, spend it on solar, and batteries (or equivalent in grid scale renewables) for every Canberra household. We would be on the way to free power for every Canberra citizen, for ever. Let’s not tick off stage 2 until we see how stage 1 goes. It's a step backwards,Trams a thing of the past,Plus it's cost the Property Investors land tax that has doubled plus rates that have nearly doubled,Buses drive around empty,why not improve bus timetables cheaper than this train that has cost Investors there future,what a mess Northbourne Avenue is, as for the high rise cement blocks that r springing up everywhere they turn into slums just look at what has happened in other major cities in the world so much for our Bush Capital. The original plans for tuggerenong included a cable car. A bus taking 100 people has the same capacity as a tram that takes 200 in twice the time. (The bus can do two trips). A transport solution doing 200km/h between woden and civic would be 1000x better than any light rail solution. And they were still voted back into office oh n also 9 percent + increase in our rates. A few things to ponder here. Firstly, the majority of people commenting here clearly catch the blue rapid bus with a frequency approaching nil. The reality is the schedule is rarely met and the reason for the quick trip between Woden and Civic is that the buses are more often than not exceeding the speed limit for most of the journey. I personally do not feel that safe on a bus that is chock a block with unrestrained passengers hurtling towards Armageddon with Ted or Terry Tradie (complete with mobile glued to ear) driving his overloaded ute one handed in the adjoining lane while trying to be inches ahead at the merge points. Secondly, due to gradient issues it appears having the light rail route follow the existing rapid bus route is too costly in terms of earth works. Thirdly, smart scheduling makes it entirely possible to schedule express light rail services by taking advantage of the crossing points along the route. Fourth, the proposition of running the light rail over Kings Avenue and along Parkes Way is an absurdity, aimed at making the project unviable. Fifth, light rail lends itself to being automated before the general motoring population, meaning the right of way will have benefits for a long time into the future. Sixth, there is no reason to be afraid. Personally, I never thought the ACT Government would seek to implement light rail because they were too risk averse and lacking in vision. We should celebrate the vision. Celebrate the vision and lament the reality is nearer the truth. It is possible that the blue rapid is retained and the tram replaces the rapid that runs through the Parliamentary Triangle and on to Civic via Kings Avenue. Given that the Government has made the decision on the alignment it should be able to tell us what the underpinning assumptions are about the retention of the blue rapid. Does anyone know if the blue rapid will be retained? The new bus network would seem to suggest it will be. I also read the submissions to the Govt about Stage 2 and the Parliamentary Triangle. So to those that support the proposal, I ask-have you thought about the cost of the project? Have you noticed an appreciable improvement in our community facilities, pools, schools and landscape? Have you checked your rates lately? Stage 1 is expected to cost every household $56K over 20 years. Double it for Stage 2. Why spend that kind of money when the patronage history of this city is absolutely woeful? It just doesn’t add up! You may need to check your maths. $56k per household is about $8.5 billion. Come on, dont bring facts into it! Based on the much hyped Gold Coast Light Rail requiring subsidies of about $50 million a year we could expect the same to be applied to Stage 1 of Canberra’s trolley folly. Stage 2 will be double that so subsidies of $150 million a year will be required. Over 20 years with indexation that will be one heap of cash. You’d be hard put to find anyone on the Gold Coast still opposed to light rail. I suspect opposition will also ebb away here once stage 1 is operating. A sign the Liberals realise this is that they’re quietly backing away from their opposition to light rail. Can you define what a subsidy is? Is that just how much it costs to run over and above fare box take or the total cost of everything including the initial capital cost? If the later can you please work out how much road building is “subsidised” using the same formula of including capital cost etc. Should I leave out costing of the considerable part of the existing road transport corridor that the tram will be using? The question we need to ask is, where do we want to go? Are we trying to deliver Parliamentary Workers just to Woden or ultimately beyond? Who says Barton-Woden is the best route? If you live in Woden Valley (WV) you might agree. But if you live at Weston Creek or Tuggeranong Valley there is no way you would drive to Woden to get to Barton. So why would a tram take that route? Sorry, you planners are off your tree if you think you are going to increase patronage that way. Aint going to happen! I venture to suggest there are more folk waiting at the airport that want to come to our city, than WV folk. I live south east Tuggies and use Ashley Drive-Yamba Drive. If Mr Barr did not give money away in land deals, we might have money for more trams or a hospital in Tuggeranong better schools etc. But where is the business case that says it’s viable, we have a very good bus network that is flexible and changeable, tram tracks can not be moved once laid without high cost, and trams will not go to hospital, take the long route, hence people will not use, maybe a step backwards and driverless technology is only days away. We will be stuck with old tech trams. My ramble.